Katrina Sue Benge, 80, Deedsville, Indiana, passed away at 11:40 p.m. on Sunday, November 18, 2018, at Dukes Memorial Hospital, Peru. Born June 7, 1938, in Miami County, Indiana, she was the daughter of Otto C. and Pauline E. Burrous Schmidt. On August 10, 1958, at St. John’s Lutheran Church, in Peru, Indiana, she was married to Samuel E. “Skip” Benge, and he survives. First and foremost, in Katrina’s life was her faith. 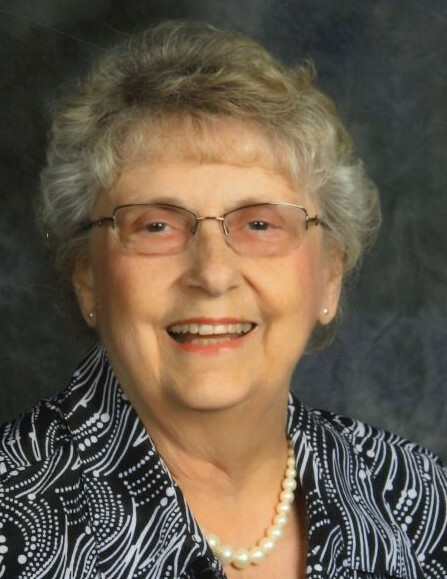 She was a great Christian, and a lifelong dedicated member of St. John’s Lutheran Church in Peru, Indiana, where she served her Lord and Savior, Jesus with gladness. She was a 1956 graduate of Jefferson Township High School in Mexico, Indiana, and for many years, she enjoyed “her kids” at North Miami Elementary School, where she worked in the cafeteria. Skip and Katrina enjoyed traveling across the United States, from coast to coast, traveling with their beloved canine companions, Jill, who has now passed, and their current puppy, Duke. They were also able to visit Alaska with a group from their church. For many years, Katrina was a 4-H leader, and she enjoyed great times with her Home Ec clubs in northern Miami County. Katrina will be missed by all, especially for her kindness and special smile. Left to cherish her memory are her husband, Skip Benge, Deedsville; children, Daryl Benge, Fortville; Darlene (Rob) Graber, Peru; Karen (Larry “Bug”) Mullins, Denver; and Diann DeVivo, Deedsville; seven grandchildren, Luke Benge, Leslie Bardonner, Kelsey and Kendra Graber, and Kyle, Gabrielle, and Grace DeVivo; twelve great-grandchildren; one brother, Enno (Janet) Schmidt, Wabash; two sisters, Christina Milner, Brownsburg; and Linda McCuistion, Mandeville, La. ; and several nieces and nephews. Funeral services will be held at 10:30 a.m. on Monday, November 26, 2018, at St. John’s Lutheran Church, Peru, Indiana, with Pastor Kenneth Greenwald officiating. Burial will follow in St. John’s Lutheran Cemetery. Visitation will be from 3-7:00 p.m. on Sunday, at McClain Funeral Home, Denver. Memorial contributions may be made to St. John’s Lutheran Church, Peru. McClain Funeral Home, Denver, Indiana, has been entrusted with arrangements. Condolences may be sent online at www.mcclainfh.com.